Line Transect: It is also called as line intercept method. In this case, plant species are recorded along a line. It is useful for dense. Vegetation. This method is rapid. It gives accurate information about the vegetation. 3. 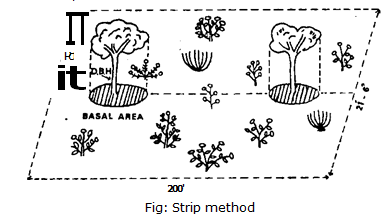 Bisects method: It shows the vertical distribution of plants or profile of the vegetation. This distribution includes all the strata or layers of the community, from dominant trees, shrubs, herbs, climbers and ground flora. 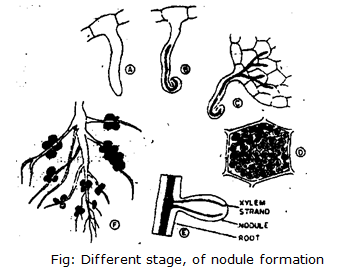 It is also used to study relative position of underground parts like rhizome, bulb, tuber and roots of each plant. Their relative positions are carefully measured. It is done by digging a trench in the community. 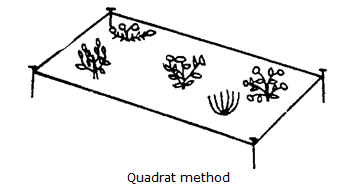 A quadrat is a sampling unit used for the quantitative study of plant communities. It may be a square, rectangular or circular in shape. But rectangular plots are more useful. A quadrat can have any size. But generally, large quadrat is used for richer and heterogenous plant community. A number of quadrat should be taken during sampling. These quadrates should include all the possible variation. It should represent the data of all the vegetation. The size, shape and number of quadrats have been determined. The quadrats are distributed in random, uniform, or stratified manner. All the plant species inside the quadrats are recorded. Then number of individuals of each species is counted. Their cover (circumference) is measured with the help of measuring tapes. The measured cover is then converted into square feet. The community attributes are density. cover, and frequency and importance value. These attributes are calculated separately for each species by different formulae of density, cover and frequency.